In the part 1 of this series, I highlighted the importance of the IT-infrastructure. In the second part I zoomed in on types of information that can be exchanged and why it is beneficial to share those types of information. This post I will discuss the process of information sharing, clarifying why information may be shared or not. The information exchange process is a complex process which is influenced by many interacting determinants. Information will only be disclosed if it is likely to serve certain benefits. If it is more certain that disclosing a piece of information would lead to benefits, organizations are more eager to share that information. However, often it is difficult to know upfront whether benefits will increase, there is always a level of uncertainty. Closely related to the expected benefits by sharing certain information, is thedivision of the benefits. It is important to have a fair division of the costs and revenues upfront in order to maintain or improve the information exchange. Trust is another important determinant of the information exchange process. If trust exists between (the people of) two parties, one is more willing to disclose information because it is expected the other party will handle the information in a proper way. Then there are control mechanisms (like NDA’s and penalties for misuse). The more control mechanisms are in place, the more information is expected to be exchanged. The level of control is highly dependent on the level of secrecy and uniqueness of the disclosed information. Nevertheless, for some types of information it is difficult to establish reliable control mechanisms. It may also be the case that increasing control mechanisms is seen as an act of distrust. A optimum balance should be established between trust and control in order to increase information exchange. Another determinant of the information exchange process is dependency. The lessdependent a party is on its buyer (or supplier), the more power it has in the relationship. An organization can exert its power to force the other party to disclose information. Although question marks can be placed at the reliability of the information, because the information can be incomplete or distorted by the weaker party in order to avoid an even higher level of dependency. 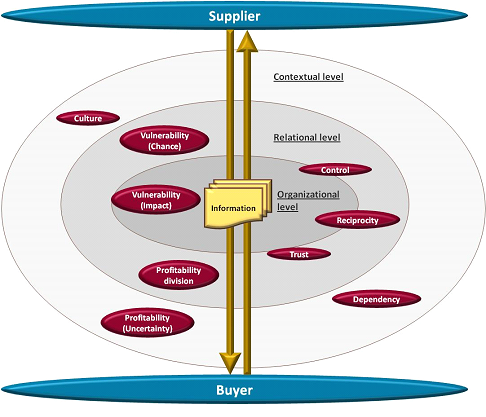 Other way around, dependency in a buyer-supplier relationship is a mutual phenomenon. An equal and high level of mutual dependency increases the level of information exchange because both are equally dependent on each other and have no interest in a damaged relationship caused by the misuse of information. With respect to information disclosure, the level of vulnerability is determined by the impact and the chance of misusing the disclosed information by the receiving party. The impact is determined by the type and importance of information. The closer the information to the core of the organization, the higher the impact and by that the vulnerability of the disclosing organization, because if this information is misused, the competitive advantage may be at stake. The impact cannot be seen apart from the chance that information is misused, or in other words the chance of opportunistic behavior. Opportunism is often referred to as the opposite of trust. If trust is present in the relationship, the chance of misuse of disclosed information (opportunism) is expected to be low, resulting in a lower level of vulnerability. The higher the impact of misusing disclosed information and the higher the chance of disclosing that information (opportunism), the higher the level of vulnerability will be. Generally speaking, less information is exchanged if a higher level of vulnerability is present. Exchanging information is a process of giving and receiving, and not just giving or receiving. Therefore reciprocity, which can be explained as the process in which both parties in a relationship send and receive information, is important in the information exchange process. If just one party discloses information, the information flow will soon stop, because the disclosing party is not getting anything in return; the relationship will be damaged. Furthermore, the flow of information between organizations with the same culture will be more fluent than if they have different cultural backgrounds. Though, if a buyer and supplier have different cultures, it does not imply that an organization never gets the information asked for, but they may encounter some communicational barriers. When trying to understand the information exchange with a specific supplier, it is important not to focus exclusively on a single determinant, because all other determinants will influence each other and the information exchange process at the same time. The different determinants and the interaction among them, make the vertical exchange of information a complex process. This may clarify the gap between acknowledging the benefits of exchanging information on the one hand and not exchanging the information on the other hand. In the next post I'll will discuss some tools which can be useful for getting grip on the information flow of your relationship with buyers and suppliers.